Please note, we are only offering a limited number of tickets at this price. Available for purchase online only. William Noble Rare Jewels has generously donated a gift certificate that entitles the bearer to $10,000 toward the purchase of inventory at regular price. Does not include sales tax and is not applicable toward special order, repairs, custom designs, or appraisal services. 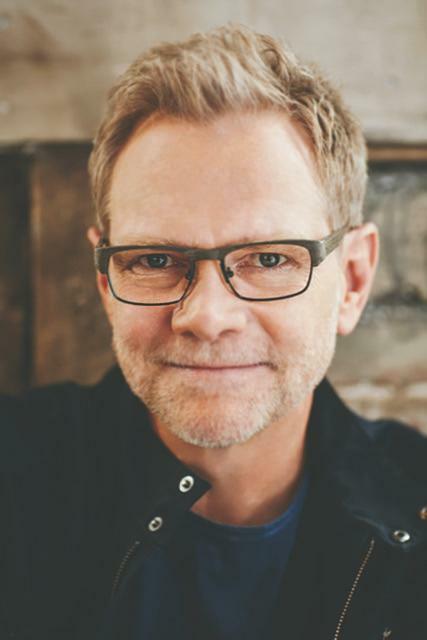 Steven Curtis Chapman has a career that has spanned 30 years and is the most awarded artist in Christian music history. He has received 58 Gospel Music Association Dove Awards, five GRAMMYs®, an American Music Award, and 48 Number 1 singles and sold over 11 million albums, with ten RIAA-certified gold and platinum albums to his credit. He has been on Good Morning America, CBS Sunday Morning, CNN, MSNBC, 60 Minutes, E! Entertainment, The Today Show, Fox & Friends, CBS This Morning, The Tonight Show, Glenn Beck’s TheBlaze, as well as appeared in the pages of People, Billboard, and Parents magazines, and more. Steven released his memoir, Between Heaven & The Real World, in March 2017 (Revell), which made the Publisher’s Weekly best-sellers list two times and the Evangelical Christian Publishers Association best-sellers list. Steven continues to perform on the road at numerous festivals and events, most recently headlining the successful Rock & Worship Roadshow Spring 2017. Last summer, Chapman wrapped his third season hosting the monthly Sam’s Place: Music for the Spirit concert series at Nashville’s historic Ryman Auditorium, where a portion of each ticket sale went to Show Hope. Steven and his wife, Mary Beth – parents to six children, three of whom joined their family through adoption – are National Angels in Adoption® recipients and are the co-founders of Show Hope. Show Hope’s work is dedicated to restoring hope to thousands of children living as orphans by breaking down the financial barriers between waiting children and loving families. More than 5,500 children from more than 60 countries, including the U.S., have been impacted through Show Hope’s Adoption Aid grants. Ray W. Washburne was born and raised in Dallas, Texas. A graduate of Southern Methodist University, Ray is the President and CEO of Charter Holdings, a Dallas-based private real estate investment company. He is the Co-Founder and Co-Owner of M Crowd Restaurant Group, which owns and operates Mi Cocina, Taco Diner, and The Mercury restaurants, and the President and Managing Director of Highland Park Village. Ray served as Finance Chairman of the Republican National Committee and is on the White House Fellows Regional Selection Committee. His ongoing involvement and board memberships include the World Presidents’ Organization, Veritex Bank, The Real Estate Council, International, Council of Shopping Centers, Urban Land Institute, SMU O’Neil Center Advisory Board, SMU Tower Center, Dallas Museum of Art Committee on Collections, Baylor Health Care System Foundation. Ray has served as an adjunct professor at the SMU Cox School of Business. He received a presidential appointment in 2017 to serve as CEO and President of the Overseas Private Investment Corporation (OPIC). Heather Hill Washburne was born and raised in Dallas, Texas. After graduating from Mary Baldwin College in Staunton, Virginia, Heather moved to Washington D.C. where she worked for the Republican Governors Association. She then returned to Dallas to serve as Executive Director of the Dallas County Republican Party and later started her own political fundraising company, Victory Associates. Heather first became involved in pro-life causes when she joined Council for Life. She went on to chair the second Council for Life luncheon and serve on their Board of Directors. Heather has also served on the board of Dallas Pregnancy Resource Center (now Thrive Women’s Center) and Focus on the Family. She currently serves on the board of the St. Mark’s School of Texas and the Advisory Board of Council for Life. Heather and Ray married in 1997 and have three wonderful children, Hill, Andrew, and Margo. Heather and Ray are active in serving and supporting their children’s schools, various ministries, and the community. Your contribution to this 501(c)(3) organization is tax deductible to the extent allowed by the law. All donations are subject to Council for Life’s Gift Acceptance Policy, available on the Council for Life website. The use of any funds received in excess of our goals for the listed beneficiaries will be approved by the Board of Directors in accordance with this Policy.